If you need a recipe to flip some crêpes on France’s Crepe Day (La Chandleur), we got one for you! We just recovered from eating a few (too many) galettes des rois and now it’s time to eat (too many we hope!) crêpes. That’s right, the festivities will kick off on February 2nd with “la fête de la Chandeleur” and crêpes will be enjoyed throughout the month of February. 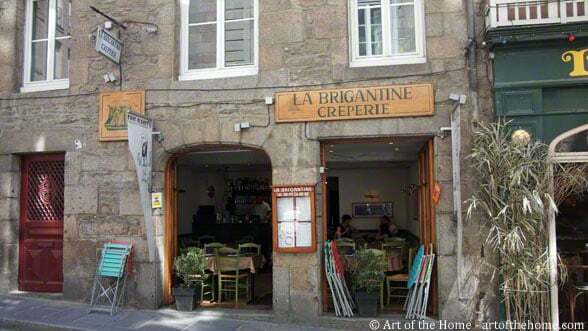 Actually in France, crepes are enjoyed year-round and even more so in Brittany where “se faire une crêperie” (go eat at the creperie) is a regional pastime and the selection is grand. 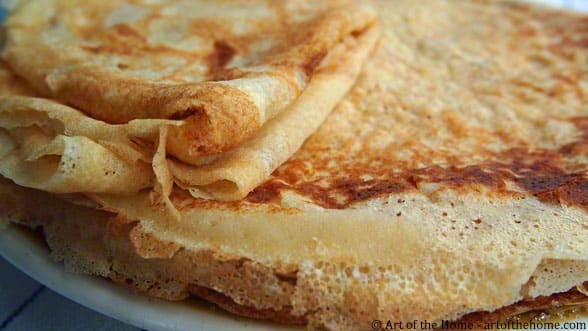 And how about some warmth with this summer shot of “La Brigantine”, a crepe (including buckwheat crepes – a favorite!) restaurant in Saint Malo, France. Would so love to open my French doors too right now, but a bit early for February. So check below for one of our favorite crêpe recipe, a grocery list so you can get your ingredients this week end and be ready for next week. You can make these crepes ahead – they are delicious cold (the key is to sprinkle them with 1 teaspoon of sugar as you make them), with jelly or Nutella – si bon! Enjoy and bon appétit!